Fiddle-Dee-Dee Designs: Extra FreeBee for August! Hey y'all! I participated in a "slow scrap" over at The Lilypad where I'm guesting for the month of August. I started by making a template based on how I interpreted the instructions, and then scrapped my layout when the instruction/chat time was over. I decided to turn my "work in progress template" into a template freebee! This is an extra one for month of August. It will be available for about a week, so make sure you go ahead and download for your stash. Here's a look at my layout. I used Real Life In Pockets Rad Lad Bundle by Just Jaimee and Mommyish for this page. Click on the image to download. Enjoy! thanks a lot for this template ! Thank you. 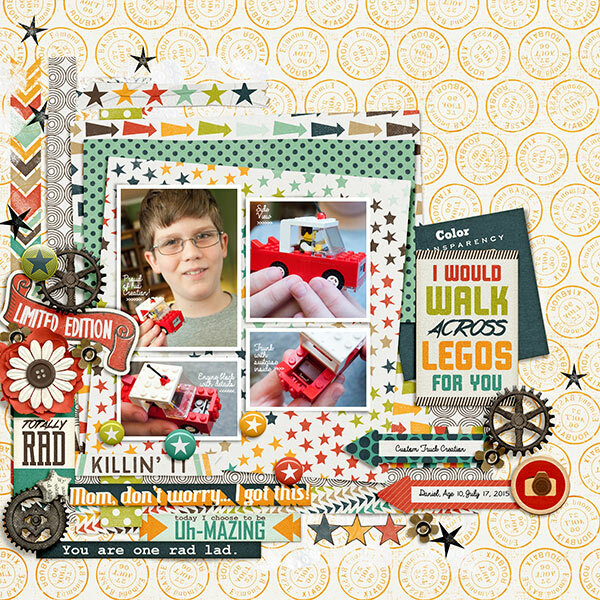 That's a wonderful layout you made with the template. I have trouble grouping things in pleasing arrrangements. This is a godsend. Gorgeous layout. Thanks for the awesome template, too. What an awesome idea -- thanks for sharing the template!